Go to college for four years and make $55K/year. Sound like a good deal? Alternatively, how about you apprentice with me, learn to write code and make twice that? When you’re done, you won’t have a diploma–just a published work. 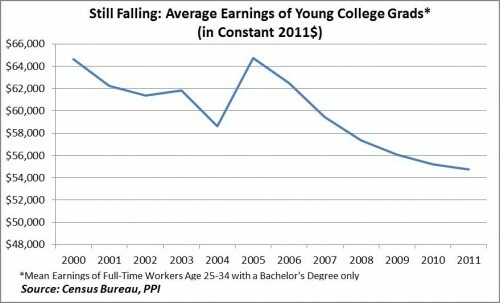 The latest Census figures show real earnings for young college grads fell again in 2011. This makes the sixth straight year of declining real earnings for young college grads, defined as full-time workers aged 25-34 with a bachelor’s only. All told, real average earnings for young grads have fallen by over 15% since 2000, or by about $10,000 in constant 2011 dollars.